The stand-up revolution: Paddle boarding has taken off. Sure, swimming and boogie boarding are guaranteed fun. But why not make this the year that everyone in the family tries a new water sport? Set a challenge for your summer holiday to master something new, and get moving. Stand up paddle boarding has taken off in popularity in recent years – it’s relatively easy to learn and suited to a broad age range of age groups. Prefer sitting down? Sea kayaking also combines a fun workout with the opportunity to explore the coastal scenery. Whether you’re paddling around the harbour beaches of Sydney or kayaking out to one of WA or Queensland’s islands, sea kayaking is a safe and easy option for the whole family. Try a guided tour or lesson before casting out on your own – you might just start a new family tradition. 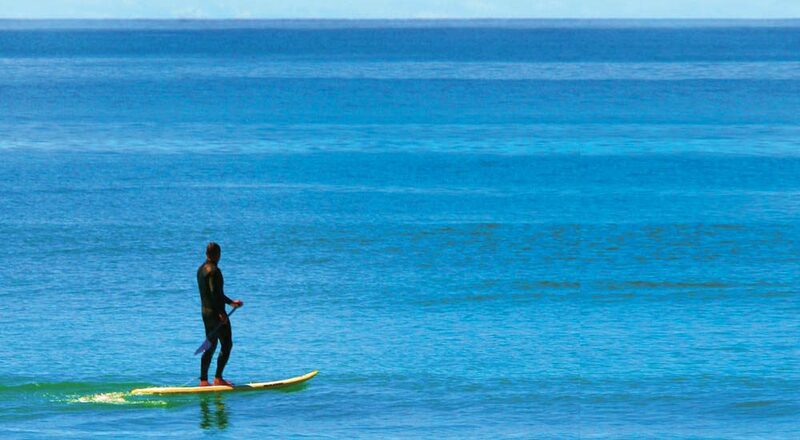 Many surf schools, such as Surf the Bay on the NSW South Coast, also offer stand up paddle boarding lessons and tours . Coral Sea Kayaking, Mission Beach, Qld – Sea kayak and camp your way around gems like Hinchinbrook and theFamilyIslands. Your guides will lead you, cook for you and explain the natural beauty you glide past on your journey. Stand Up Paddle Centres, Sydney and Brunswick Heads, NSW Kids’ school holiday camps, fitness classes and lessons throughout the year. Capricorn Sea Kayaking, WA Sea kayaking tours around the stunning Ningaloo Reef region, and stand-up paddleboard lessons and hire. Choose anything from a half-day to five-day safaris.